It is almost surrealistic. Israeli paramilitary police raid the Makassed hospital in Arab East Jerusalem firing rubber bullets, sound grenades and tear gas. Can you imagine t his scene happening to a Jewish hospital in Israel? If you expecting to see this on the BBC don’t hold your breath. Only Palestinian violence is newsworthy. Amid weeks of violence in Jerusalem, Israeli police and special forces raided an East Jerusalem hospital for a third day in a row on Thursday and fired tear gas, sound grenades and rubber bullets into the medical compound, injuring three patients. Israeli police first burst into Makassed hospital in the Mount of Olives neighborhood on Tuesday with a court order to confiscate the medical records of a 16-year old patient who was treated on October 13th for injuries from a gunshot wound. “They were not trying to confirm that he was shot—because they have him [the patient] in custody and so they know he was shot and they can confirm the bullet wound, but they wanted to see who was with him, who came in with him to the hospital,” said Dr. Rafiq Hussein, the director of Makassed hospital, who questioned why police undertook a militarized operation inside of his facility. “They were after not a dangerous person, or a wanted person, only a file,” he noted. The following day police returned to the hospital in increased numbers. Hussein said hospital staff were unable to tend to patients as 40 to 50 masked officers again ran into the hospital seeking security footage and interviews with the staff who treated the injured minor. “They stopped what they were doing because police had come into the middle of the hospital. There was almost a clash between the staff and the Israeli police, because this is a hospital and they [the police] should not have been here,” Hussein said. Two doctors were taken to a nearby police station where they were questioned about the individuals who accompanied the wounded 16-year old patient, according to Hussein. Police requested an additional four nurses report for interviews over the weekend. Several medical staff were questioned inside of the hospital. 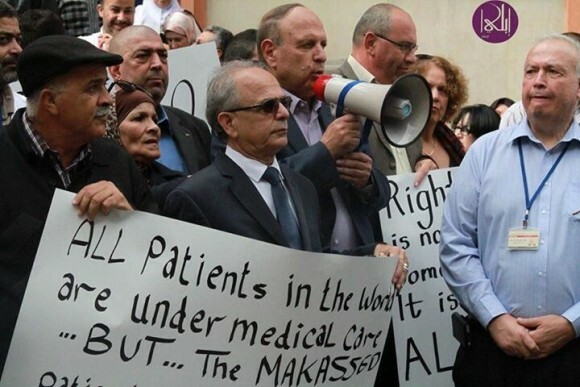 On Thursday doctors and nurses held a demonstration in the gated courtyard of Makassed hospital in protest of the police entry, which they said disrupted their ability to care for patients. Hussein indicated all hospital personnel complied with the court order, appearing for depositions and turning over the requested file and security footage. Palestinian media reported that three patients not participating in the medical staff demonstration were shot with rubber bullets during the demonstration. Israeli police also erected a checkpoint last week outside of Makassed hospital’s sister facility, Augusta Victoria hospital, located a half-mile away on the Mount of Olives. The crossing is one of more than a dozen new checkpoints built across East Jerusalem neighborhoods in recent weeks, during which Israeli forces have killed more than 60 Palestinians, and Palestinians killed ten Israelis in attacks. 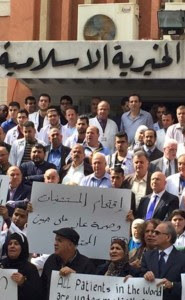 “These concrete barriers/roadblocks have led to major delays in the arrival of patients and their companions to their hospitals’ destination, employees and medical staff such as doctors and nurses, as well as to the disruption and delay of the patients’ movement from one hospital to another,” said the East Jerusalem Hospitals Network.